Pigs, together with beef and poultry, are one of the basic animal types which supply the world’s nutritional needs in the form of high-quality meat. According to statistics from 2012, the world production of meat was 302,000,000 tons, of which about 36% was pork, 35% poultry, 21% beef and veal, and 8% others. In the worldwide trade in pork, for years competition has been intensifying, both in the world and European markets. In recent years, the political situation has had a significant impact, as has the occurrence of diseases such as African Swine Fever and Porcine Epidemic Diarrhoea virus. Soon, according to estimations, the production of pork will increase in most of the leading pork-producing countries. The EU pork market has been strongly impacted by the Russian embargo. The European Commission estimates that in 2014 exports from the EU to other countries dropped by about 10% compared to the previous year. Drops were noted in Lithuania, Poland. Germany, and France, whereas export rose in Holland, Spain, and Belgium. There was a total collapse of export to Russia and Belarus, and a drop in exports to Ukraine and China. On the other hand, exports rose to countries such as Japan, South Korea, and the Philippines. In Poland, in 2104 for the first time in years this drop in numbers of pigs appeared to stop, and even increase by 2.3%. In June of 2014, the pig population totalled to 11.7 million. The national pig breeding industry had fallen on hard times, considering that the pig population which in 2007 had numbered 18.1 million had fallen over the course of the next years to 11.1 million in 2013. This drop was related to significant imports of sucking pigs and other pork meat into Poland from other EU countries. In 2005, Poland was the 4th largest producer of pork in the EU, whereas in 2012 it fell to 5th place. Our country is still a significant producer in the EU, currently taking 6th place in terms of total pig population, which is 7.8% of the EU total, and we supply 8.1% of the total pork production. According to statistics from the National Statistical Agency, the consumption of pork in 2013 amounted to 35.5 kg per capita annually (in 2007 it had been 43.6 kg), which accounted for 5.6% of total meat consumption. The average consumption of pork per capita in other EU countries for 2012 was: 66.1 kg in Spain, 64. Kg in Denmark, 53.3 kg in Germany, 59.9 kg in Austria, 46.4 kg in Portugal, 43.5 kg in Belgium, 37.9 kg in France, 36.9 kg in Italy, 36.1 kg in Ireland, and 34.7 kg in Sweden. There is thus the possibility that consumption will return to levels above 40 kg per capita. To a large extent, the future of this sector in Poland will depend on an increase in consumption. Poland is a country which has long traditions in pork production and high quality cured meats. Perhaps the drop in consumption is related to an antiquated opinion that pork is fatty and unhealthy. The latest research however has indicated that this opinion is unfounded. The amount of cholesterol in pork is currently lower than that in poultry. Long-term work on the reduction of fat percentages in pigs has resulted in a leaner meat with high nutritive qualities. More and more often, we see in the literature the opinion that pork can be a functional food, based on its essential unsaturated fatty acid content, bioactive peptides (carnosine and glutathione), choline, and other micro and macro elements and vitamins. As much of the pork (50%) that is purchased by consumers is bought as raw meat for processing at home, great attention should be paid to the culinary qualities of the meat. 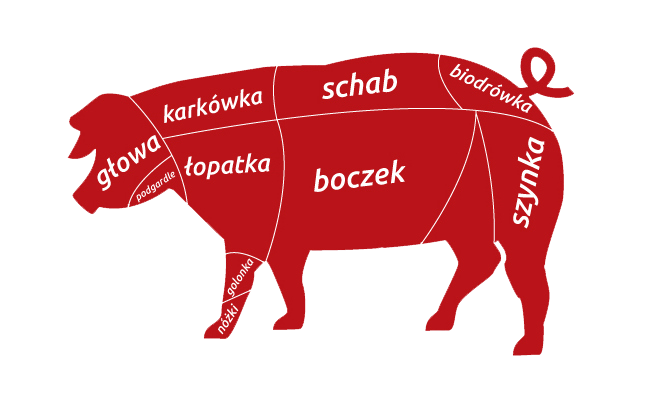 Studies show that pork originating in Poland is characterised by good sensory properties. This high quality together with price will be two of the essential factors influencing its consumption in the future. Consumers expect meat to have excellent sensory properties, high nutritive value, and that it will be inexpensive; more and more often they are interested in knowing that along the whole production chain, from field to table, the producers have guaranteed high quality, health safety, and concern for the animal’s welfare. There is also a growing interest in traditional and regional produce, and meat products made by small, local businesses. In summary, one could say that the future of the national pork production and processing sector will to a large extent depend on us, the consumers, and that’s why we support Polish pork.